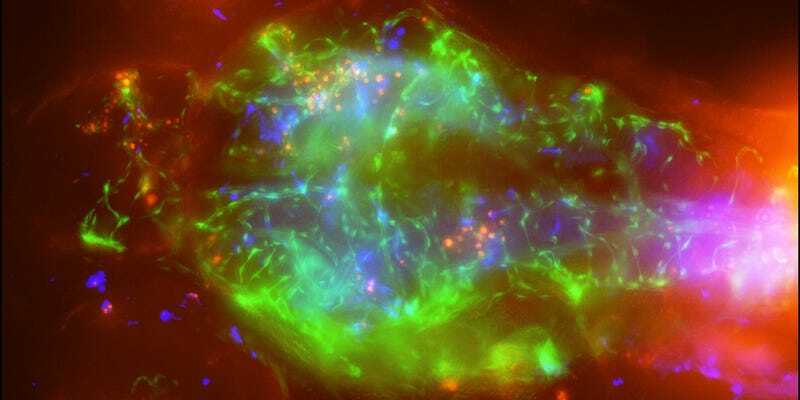 It may look like a sci-fi space scene or a Fear and Loathing out-take, but this image, which shows a a zebrafish larva infected with meningitis, could help researchers develop new treatments for the disease. In the image, you can see the Cryptococcal meningitis organism as red dots in the brain of the zebrafish larva, while macrophages, shown in blue, attack the infection. For a little context, the green parts are blood vessels in the tissue around the brain, and you can just make out the edge of the eyes of the larva at the top- and bottom-left corners. Cryptococcal meningitis typically enters the human body through the lungs, before it finds its way into the bloodstream and then crosses the blood-brain barrier. It kills over 600,000 people worldwide each year. By studying how it moves in a live creature like this, the team of researchers from Duke hope to be able to quickly test new drug compounds in order to work out how effective they are.